Issue #3 contains two complete wargames. NAPOLEON IN ITALY is a two-player game covering part of Napoleon's Italian Campaign against the Austrians in late 1796. The game includes 8.5" x 11" cardstock mapsheet, set of color, uncut unit counters, and full rules. The second game is STALINGRAD: THE LEATHER FACTORY. This is a solitaire design based on the early September, 1942 German assault on Kuporosnoye at the far south of Stalingrad. The player controls the German 29th Division, and the game system handles the Russian 35th Guards Division defenders. The game includes 8.5" x 11" cardstock map, set of uncut, color unit counters, and full rules. This game is presented as a simple "standard game" suitable for novices, to which several advanced options can be added. The game stresses "uncertainty" for the solitaire wargamer, which is provided by hidden Russian units, random reinforcements, vairable "daily orders" from HQ, and imprecise victory conditions. 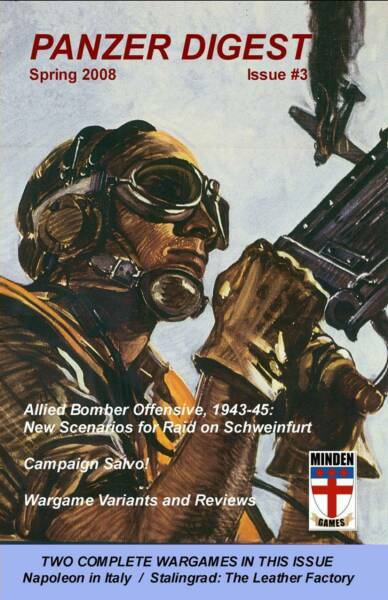 This issue is also chock full of articles, including an article on the Allied Bomber Offensive in Europe, 1943-45, along with new scenarios for RAID ON SCHWEINFURT, campaign game rules for Minden's SALVO!, a variant for Victory Games' KOREAN WAR, and some "house rules" for use with BATTLESHIP CAPTAIN and BATTLEWAGONS. Also included are game reviews (Avalanche's JUTLAND, and Guild of Blade's GRUNT), plus the usual magazine columns. We're sure you'll enjoy this edition of the DIGEST! FOR YEARLY SERIES SUBSCRIPTION INFO, AND BACK ISSUE AVAILABILITY, VISIT THE Ordering Page.